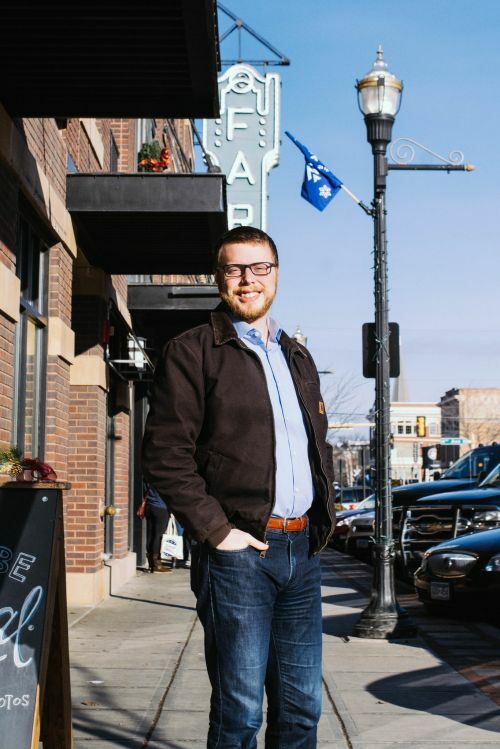 FARGO – Ben Hanson is young, but politically, he’s already made a name for himself. He’s the “hard-charging Democrat opponent” running for the state’s only position in Congress. He’s running against Kevin Cramer, bestower of the title and the congressman “too many in North Dakota know little about.” Hanson plans to represent North Dakota in Washington D.C.
Hanson leaned back in his chair, took a sip of his coffee – black. He appears to be a bundle of energy, a lone knight in a red state eager to take on a muscly dragon. Silly legislative bills proposed while he was the ND House of Representatives Democratic Caucus chair roll quickly and easily from his tongue. Politics is his passion, there’s little he doesn’t love about the role of a public servant. Although the election is still a year away, Hanson, 31, is running a grassroots campaign, with more than 500 unique individual donors, 75 percent of whom are from North Dakota, and believes he has a fighting chance. Instead of filling a large campaign purse with $50,000 for a video producer, and another $40,000 to place a television ad, he’s hitting the Internet: Hulu, YouTube, Facebook, Twitter, Instagram, and soon, his campaign website. With modern technology and using social media programs, he can get his message to a wider, younger audience for $4,000, Hanson said. Hanson sees the Republican Party, historically at North Dakota’s helm, as an “abject failure.” The state needs to enter the modern world, there’s streamlining to be done, websites to be made, and a statewide population of nearly 800,000 people that need a more transparent government. People he’s met while traveling to eight cities in two weeks have proven to him government and the media are far from transparent. Some people hardly know when the legislature is in session; one woman asked him if he went to St. Paul for his job. He takes aim at Cramer’s voting record, and the current congressman’s claims of calling AM radio shows “Town Halls.” The two real Town Halls Cramer hosted, called “Coffee with Cramer,” both turned into heated shouting matches, with one irate man shoving money into Cramer’s collar. “He also doesn’t raise the flag when individual parts of a bill are problematic, there is so much I could say about the tax reform bill,” Hanson said. Or a bill called Section 199, which raises taxes on co-ops, to which Cramer didn’t raise any alarm or offer an amendment to try and stop it, Hanson said. Despite Hanson’s young age, he’s experienced, and while working in the state legislature from 2012 until 2016, became aware of the games being played by many elected politicians. Politicians basically follow the agendas of their main supporters, and rarely their own constituents. Hanson isn’t planning on beating Cramer’s campaign wallet, which so far has raised $650,384. Cramer’s largest contributor is Energy Transfer Partners, the oil company behind the controversial Dakota Access Pipeline, with a donation of $31,050. Hanson wants his donations to come from North Dakotans. Politicians within the majority party cannot cross the aisle and support bills made by state Democrats, Hanson said. Raised in Fargo, Hanson comes from a farming family, with a history in politics. His grandfather, Erwin “Bud” Hanson, from Crosby, served as a state senator. His mother’s side came from Casselton and Amenia, and helped form the first sugar beet co-op in America, which later became Crystal Sugar. After graduating from MSUM, Hanson was elected to Fargo’s District 16, where he served two sessions. He also worked finance for Tim Mathern D-N.D., in his run for governor in 2008, and worked with Senator Kent Conrad D-N.D., where he fell in love with politics after helping a suffering North Dakota resident save his eye through reexamining state policies. When Hanson isn’t on the road, two hours every morning are used for raising funds for his campaign, and then on to his day job as a commercial real estate broker for Archer Real Estate Services. Hanson’s platform is easy to understand. He is for net neutrality. He is against arbitrarily raising property taxes, says current strategy is more like “robbing Peter to pay Paul.” He’s for getting a farm bill renewed that works for North Dakota farmers, including crop insurance remaining intact. Finding a national solution for cyber security is high on Hanson’s political bucket list. Health Care: For Hanson, workers need raises, and only by ensuring economic security for the middle class can that be achieved. He wants to ensure more than 300,000 North Dakotans who struggle with preexisting conditions are not neglected, and that their essential health care benefits are protected. More than 90,000 North Dakotans are also on Medicaid, and as the nation tackles the opioid epidemic, Medicaid is the most important tool at the federal government’s disposal for saving lives, Hanson said. Additionally, more than half of Native American children in the state also depend on Medicaid for basic health needs. Medicare, according to an article written by Hanson, is a promise to the elderly that paid into the program with a lifetime of work. “We cannot abandon those who rely on this critical program,” Hanson said. On October 5, Hanson wrote an article explaining his position on the Children’s Health Insurance Program, or CHIP, criticizing the Senate Finance Committee of procrastination, and putting the health of millions of low-income children at risk. Retirement security: While reducing the national deficit, it’s also vital that Social Security and Medicare programs are not reduced, but strengthened. Recently, massive cyber attacks targeting Target, Home Depot, the SEC, and Equifax, which more than 140 million Americans, including 200,000 North Dakotans, had their person information exposed. Hanson also supports overturning a law recently passed by Congress to authorize Internet Service Providers to sell personal data for profit. Infrastructure: Rebuilding the country in ways that will compete with Asia’s light rail, and bringing America back into the modern era.